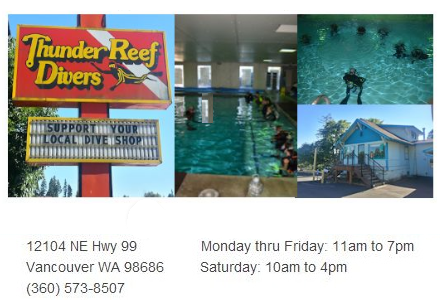 Thunder Reef Divers – Portland & Vancouver Scuba certification classes – Your diving adventure begins here! The scuba shop that has it all! - Air and Nitrox tank fills! - Largest selection of snorkle gear in stock in the area! Certified Open Water Diver Course Only $595! We have a monthly Discover Scuba class. You can try out scuba in our indoor heated pool. All you need is a bathing suit. If you have a group of 4 or more people we can schedule you a private class just for you. Local dives or warm water tropical expeditions we do it all. We have monthly dive activities organized by the shop. This could range from a local dive or a movie night, but it involves divers getting together. Keep an eye on our Facebook page or shop calendar to find out more. We have a full service shop for all your dive gear service needs.